Within just the past few years, social media has transformed from being a teeny bopper tool for flirting into a tremendous source of communications and a social force with which to be reckoned. The road has been a bumpy one though and not everyone has performed well in the new media. Major travel brands have an automatic advantage when it comes to social media. In most cases they have long established and trusted brands that people seek out. As compared to bloggers or smaller travel companies, these brands really don’t have to work hard to first attract followers. However, they do have to work hard to keep them and this is where most fall short. Having worked in a professional work setting for my entire career, I can easily imagine how most companies make social media decisions. Big Boss: I read an article that social media is important, we should have a presence. Manager: Ok, but everyone is pretty busy with their current workload. Big Boss: No problem, let the intern do it. He’s young and understands it better anyway. Plus who cares, we just need to be there. Let’s first set the stage. The average Facebook user is 38 years old. The average Twitter user is 39 years old. The average age of any social network user is 37 years old. 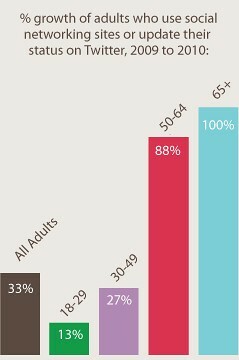 47% of internet users age 50-64 are now using social networking sites. Twitter rates for users 50-64 increased 88% 2009-2010 and 100% for users 65+. Pretty surprising, isn’t it? The average social network user is mature, educated and informed. Not exactly the prevailing image one would expect. So why then would you hire someone who can’t relate to these individuals to lead your social marketing team? I’m about to make A LOT of assumptions and am ASKING to be corrected. I hope that my hunches are wrong, and they will be in some cases, but in most cases they will hold true. From spending a couple of years observing travel companies on both Twitter and Facebook I have noticed some themes. The first is the most surprising to me personally, the sin of not engaging. The entire purpose of social media is to reach people in ways that are faster, more easily accessible and more personal. Unlike massive PR campaigns or TV ads, social media allows a faceless brand the opportunity to humanize themselves and interact with their customers and potential customers at a very personal level. And yet, so many fall short of this. I have been followed by several airlines, hotels and other travel companies that don’t even have a single tweet in their history. Rather, they created an account, gained followers and gave up. Either they didn’t have the staff to carry through on their efforts or they lacked desire, but either way the effect is equally disastrous. Companies should not start social network accounts because they feel they must have a presence. They have to start them in order to better interact with their customers and to better build their brand. Social media can be invaluable for PR and media efforts, but only if you play in the social sandbox. One level up from the asocial brands are the brands that only push deals, specials or press releases. I can’t tell you how tired I am of only seeing Tweets or status updates from companies that only talk about how great they are. Why would I assume anything other than the fact they support their brand? I don’t care if they got the triple star diamond clover award for best bellman in Toronto. It matters not to me and if that’s all I wanted to know, I’m sure I could find it on their web site. Similarly, it is equally tiresome to ONLY see promotional updates from brands. Some are expected and indeed welcomed, after all I’m probably following because I want to score a deal at some point. But to ONLY talk about these promos is bad social media etiquette. So what should these brands do? I’ve assembled a few steps all travel companies should take in order to become a true presence in the social network realm which will, in turn, serve to promote their brand and hopefully increase business. 1. Create strong, easily identifiable accounts on major social networks. Ok, if you’re a major company you’ve already done this, but it doesn’t hurt to revisit the account. Is the image the one you want to associate with your brand? Does the one-line description adequately describe you? The splash page on Facebook is more important to customize than Twitter as “liking” a brand on Facebook is frankly a bigger commitment than following on Twitter. Make sure it is readily apparent that following you won’t be a waste of the user’s time. 2. PERSONALIZE – It’s great you’re a huge, multinational company that has tremendous name recognition. Yay you! However, social networks are about being social, and that means humanizing things. Some major brands indicate the name of the person communicating on their behalf, which is great. If that doesn’t work for you, then share some things once in a while. It’s ok for Marriott to say that the snow made traffic in DC unbearable that morning, no one thinks Tweets are done by a computer. That in turn is a great way to ask your followers about the weather where they live and if they’re planning a warm weather vacation. In the same vein, one person really should always be handling all social media updates whenever possible. Voice and tone are extremely important, especially when you only have 140 characters. You want to build a following around your brand, but also around the personality of your brand as well. 3. Promote yourself and others – Social media is a great resource because people are constantly sharing information, both their own and of others. I absolutely expect major brands to send out updates about their products, properties or whatever. But I also expect them to share information they think their followers may find valuable. Even though it doesn’t relate to US Airways and wasn’t written by them, a retweet on an article about packing or how to travel with kids would be great to see. It shows me that they care about their customers and that they care about more than just selling seats. In all social media, but especially so on Twitter, companies that ONLY push press releases or updates without interacting in a positive way or retweeting anyone else is very quickly ignored. The account becomes virtual white noise. 4. Engage, don’t just react – This relates to #3, but it is vital to engage with your fans and followers. You accomplished the hard part, you got them to follow you. Now you have to keep them. Follow what they’re saying, interact, ask questions, be helpful – in other words, participate fully in the social network. I’ve seen a lot of companies, airlines in particular, act just like a complaints board. That will no doubt be a part of the work, but it shouldn’t stop there. Social media is a two-way street and it’s time to start thinking that way. 5. Blogs aren’t for press releases – Many travel companies also have corporate blogs, which is great. However, I fear they were started simply because someone heard the word ‘blog’ in the news and told a subordinate to start one. Not all corporate blogs are bad, Kiwi Collection does a superb job with theirs, as do many others. What is key though is to make sure your blog isn’t a place to copy and paste press releases. Once again, I expect companies to promote their business, but I don’t need it all the time. Rather than tell me about the great conference rooms at your resort in Aruba, tell me the top 5 things to do in Aruba that would actually make me want to visit. Highlight your business in an indirect way, while always providing information to make sure your resources are used should a trip be booked. It’s a balancing act, no doubt, but that’s yet another reason why you need an experienced professional at the helm. I didn’t include the ability to relate, because I think it depends on the brand. But in general, companies need to avoid giving social media responsibilities to the lowest person on the totem pole. As I previously noted, the average user is in their late 30s, probably has a family, probably is a professional and needs someone who can relate to all of those attributes. Like it or not, the information sent and even the tone of the account matters in this regard and staffing decisions should be made accordingly. I didn’t write this to pick on companies or to overly criticize them. On the whole, I think most are doing a pretty good job and a small number are even excelling at it. The corporate environment demands a quantifiable ROI, which may not always be readily apparent from social media usage. Just as the effectiveness of some other forms of PR are hard to ascertain, so is social media. While it may be difficult at times to easily quantify all of the benefits, it is very easy to see the negative effects of not engaging or engaging poorly. Great read Matt. I do social media work for travel companies, and while many travel bloggers/writers “get it”, travel brands on the whole DON’T get it. I’ve seen companies such as airlines or cruise lines, which have thousands and thousands of followers, but haven’t used their Twitter or Facebook in months; or even use it only as an automatic feed of their blog or press releases. I honestly rarely follow travel brands, mainly because to me, as cliche as it may be, social media is more of a cocktail party and less of a speech and many of the brands that follow me on Twitter, for example, will never interact with me. The ones I do follow, have typically interacted with me in some way. Travel companies would be smart to better tap into the socially savvy travel community. It’s very much the same situation as when the internet went mainsteam. A lot of people built web sites because they had to be there but didn’t think much about it they just needed to be there. Give it time and people will learn that ‘being there’ isn’t enough. Thanks for the great comments, I appreciate them. I also forgot to include CVBs, but everything here applies to them as well. And just as with travel companies, some do a great job (Banff Squirrel and Visit Britain) and others don’t. Think you’ve totally missed the mark, Matt, and I encourage all other CVBs, especially those with ski hills and/or mountains, to completely ignore this post. Oops. Ok, for the (il)literal readers: that was a joke. Matt’s once again giving great advice and the travel industry would do well to listen. Great post. It’s all about finding a balance. Deals and promotions have a place but only in the context of engaging other people. Such an interesting post about the power of social media. I’ve been completely blown away over this last year as I’ve forayed into it. Great post, Matt. Like Spencer, I rarely follow the big brands, too, mainly for all the reasons you pointed out in your post. They really are missing out, and I think the ones that get on board sooner rather than later will benefit tremendously from it. Twitter, facebook, and other social media sites are NOT going anywhere, and they are the future of business, travel or not. I will be curious to re-read this post 6 months, a year, 2 years from now and see where the travel industry is. Nice conclusions. So many travel brands get social media wrong. The worst are those that think themselves above social media. I am certainly turned off by a brand or company if they think themselves too good to talk to me. The same goes with travel bloggers. There are some you will tweet at that ask a question, and perhaps they think they are too cool for you, will never acknowledge you said something. I tend to not want to read anything by those people or companies. You can never put yourself above your audience. I’m definitely impressed at just what effect social media can have on ones brand. If you don’t follow the tips you laid out here, you may as well be dead in the water unless you’re some giant recognizable name. Excellent post. I agree with you about engaging. It amazes me how many of the big companies don’t engage on social media. When someone actually does interact with me I am surprised. There aren’t a lot of corporate companies that do. I will point one that I have worked with that actually gets it. Princess Cruises. They give me a thanks, retweet or hello when I give them a tweet or facebook mention to this day. So many other companies never even acknowledge that I have just shared their product with thousands of other people. I have even worked with others that don’t even retweet about the trip that I have just been on, on their dime. It is so frustrating. they have thousands of followers and they could be sharing our incredible experiences with their readers and they are just too uninvolved to bother. While I am not personally offended, I am still amazed that they don’t see the value of engaging with a person that cared enough to share their information with their readers. I think that Bloggers should take over all social media for corporate accounts. We could really show them a thing or two. Great points and I agree, the travel world could stand to listen to bloggers once in a while. Very helpful post on social media suggestions for the travel industry and CVBs. I also appreciate that you reference facts and sources in your statistics. You are absolutely spot on regarding your social media observations and use of interns. As a PR director for an agency, I have been tempted to utilize interns for social media. However, I agree that consistency with social media is key. Thus, the reason our company blog sits idle. I simple don’t have time to attend to everything. Putting on my freelance writer/blogger hat; I feel the need to chime in regarding Suzy’s comment about travel brands and travel bloggers considering themselves above social media. While I try to respond to all questions asked of me on Twitter and on my blogs, I am only one person, attempting to run several blogs, write freelance content for newspapers and magazines and travel. For some of us, it is not a matter of being ‘too good to respond. It’s a matter of being-overwhelmed in the social media world of being available and accessible 24/7. Really great post! Now, if only some of those big travel brands would read this and take your advice! I agree with you that most companies just don’t get the positive impact social media can have – if they do it correctly. And engaging with followers and fans (i.e. customers!) is the key. Not to say they’ve all got it wrong, of course. An example of a brand doing things right is Air New Zealand. Their Twitter account is awesome, and they respond to and RT tweets all the time. It’s not just a computer; there are people in charge of the account, seemingly at all times. My favorite was a story about a girl who tweeted about the terrible music playing in an Air NZ terminal while she was waiting for a flight. @flyairnz tweeted her back, asking her what she’d prefer to hear, and then changed the music. Now THAT’S the kind of customer relations every company should shoot for! And, they fact that I remember this exchange of tweets definitely says something, too. I only wish QANTAS would get with the program (so to speak) and engage in the same way Air NZ do. Not for one moment can I imagine Qantas changing the music. In fact, it’s damned hard to get them to even make an announcement about why a flight is mysteriously running 25 minutes late! But once again, it’s Kiwis showing the world how to do it right. No wonder NZ is such an awesome tourism destination. For hotels and airlines their social media presence has to be split between normal PR/interaction and dealing with complaints. It’s just a fact of life. The good ones have handled this in a number of ways, including creating separate ‘customer concerns’ social media accounts that don’t take away from the main account. The best approach for hotels seems to be having customer service reps take over their property’s account, leaving the large, multinational account to deal with more positive issues. Yep, agree with all your thoughts man. Here is an example of a brand doing something right: Today I RT’d an HBO tweet about the show Treme and how it was the closest thing to being in New Orleans without going, and they responded saying they agree. It gave me the “warm and fuzzies” and made me feel like HBO is my friend, no joke, it works! Outstanding post, Matt! I’m not sure how I missed it when you initially published it. I agree there’s a lot of work that needs to be done in educating not just travel companies, but all businesses, many non-profits, and even small business owners. People often don’t really understand the “social” part of social media. And unfortunately, if a company doesn’t “get it” they aren’t going to put the resources behind it (in terms of hiring dedicated staff members to represent them on social media), but may instead add that responsibility onto an existing staffer’s (probably) already overworked shoulders. Which is part of why they’re not doing it well. But everyone needs a learning curve, and I hope that in time, they “get it”. I’m sure there are still tons of things I’m doing wrong on social media, mainly because there are only so many hours in the day to learn it. I’m jumping in a little late in the game, but just stumbled across your post and found you made several excellent points about the state of social media adoption in the travel industry. I too work with many travel professionals to develop social media strategies and have found a real mix of opinions about the use of social media for business. One aspect that wasn’t considered in the post and I think it important pertains to adopters who are trying to make a case for the use of social media in their company to a group of non-adopters. This all too often accounts for many of the abandoned accounts you mention. 1. The marketing team knows it wants to use social media and has a plan to move forward, only to be stopped by senior management who is skeptic about the benefits or doesn’t want time wasted on it. 2. In order to try to move forward with the plan in a collaborative manner, the marketing group then convinces said senior management to start small with one account and see how things go. 3. Senior management agrees but makes it clear that the whole company should not be mobilized over it. As you know, the marketing team cannot operate in a bubble and without senior management support or someone waiting to say “I told you do” it’s often hard for the marketing team to get full by-in from key players who can provide content or support to the efforts. This is where the newly created account becomes harder to manage and often ineffective. When this happens, I’ve rarely seen the channel survive more than a few months. This happens in companies big and small every day. There is still a huge amount of disagreement over the effectiveness of social media in the travel industry and I think a lot of it can be chalked up to poor planning and execution as you pointed out. Unfortunately, the poor results this is generating is also keeping the skeptics away and making it harder for the adopters in the company to move the social agenda forward effectively. It’s a bit of a vicious cycle. This is a great article. You are correct that brands need to engage their audience (customers) with social media and not to just utilize it as a platform for self promotion. It eventually becomes like so much other junk mail. But often times it does become a balancing act. Personally, I find it difficult at times to keep on top of everything social media. The platforms seems to change on an almost daily basis. I.E. new apps for this and updates to that. And too we have to remember that we are setting the rules and standards as we go. I think a key point is consistency. You don’t have to be the greatest writer to populate a blog, you just have to work on it regularly. Similarly, you don’t have to be the wittiest or most clever guy in the office too engage someone via twitter. (although it doesn’t hurt). If brands will realize that customers want that personal connection, which only takes a small effort, then they will begin to understand the beast which is social media. You’ve made some great points here, Matt. I’ve had some really good experiences working, and interacting, with CVBs/DMOs online, but I’ve also had some extremely frustrating experiences. Social media is works best as a two-way street, as you point out. CVBs or DMOs that simply get on Twitter or Facebook to broadcast their own information aren’t that useful to anyone. When organizations never answer tweets or FB comments directed to them, never bother to share relevant information that doesn’t happen to be on their site, and fail to follow anyone…it makes it difficult to work with them. The easier a group makes it to work with them, the easier it is for me to cover something in their area—versus deciding to work with folks in another destination. I’ll sometimes try contacting a tourism group via a DM, for example, if I plan to be in their area, rather than gumming up the public Twitter stream with my questions. It’s a great way to make an initial contact in many cases, and several of my best relationships with tourism folks started just that way. If they don’t allow me to DM them or ignore all messages directed to them, then the relationship never has a chance to start…and there are probably a lot of good stories I miss covering because of that. The biggest problem I see with travel organizations on social media is that they only staff the social media accounts during office hours. They have customers 24/7, with those needing the greatest service often after 5PM. Companies should understand that managing social media is not the same as issuing press releases. This is a great article and while for the most part I agree, I get people like you and JD Andrews and Jeff Titelius that really interact, this is not a travel push it on you job, it is them sharing their passions. I love that. I follow all of you for the excitement you bring to me via your pics and your savvy. I won’t even read why most travel agents are bad. I’m sure that a lot are, but that was my career for over 28 years and I must say even if it sounds a little conceited, I was the best travel agent EVER. My clients had me from the time they walked in my office until their return home and follow up. My clients were in all 50 states and 6 different countries. All word of mouth. That speaks volumes. I did exotic travel, vacation planning, renting yachts, you name it, I did it. In fact my rolodex is still in high demand amongst my peers. The airlines took a career away from me, I adapted, tried it on my own, but mostly was left with corporate customers. As important as they are, it is not my thing. I must have a challenge. I loved it. I think that social media gets a bad rap because companies are certain you are wasting resources. I was at home on Facebook, talking with a co-worker about a chair at work and the VP emailed us and told us to never talk about work again on Facebook. I said we did not break corporate compliance, nor did we break any rules, use company equipment or resources. it was a freaking CHAIR!! On the other hand, if a sale would happen that day, I’d be on Facebook telling my friends to tell everyone they knew we were having a great sale. That generated a lot of money for the company. They have their own Facebook page, but nobody I know “likes” it. So they depend on me for info as they don’t want to search through the commercial they have running on Facebook. Sadly they still haven’t gotten it. This was very informative and I appreciate all your articles. Your pics too and that is why I follow you. You are passionate about this stuff and that is what I’m looking for. Excellent post! I just read a social media update that talks about the “bubble burst” of usage. I think many users are getting content fatigue from being bombarded on FB and Twitter by bigger companies sharing news the way they’ve always done … en mass without a personal touch. Because of that, people are starting to “unlike” and “unfollow” as they feel they are being spammed. For bloggers, the audiences might be smaller, but the connections and engagement is much stronger. One hotel I find using Twitter in a very personal way is The Four Seasons. Each hotel has their own personal account, and someone on location tweeting from it. The messages are always relevant, helpful, and sometimes even fun.